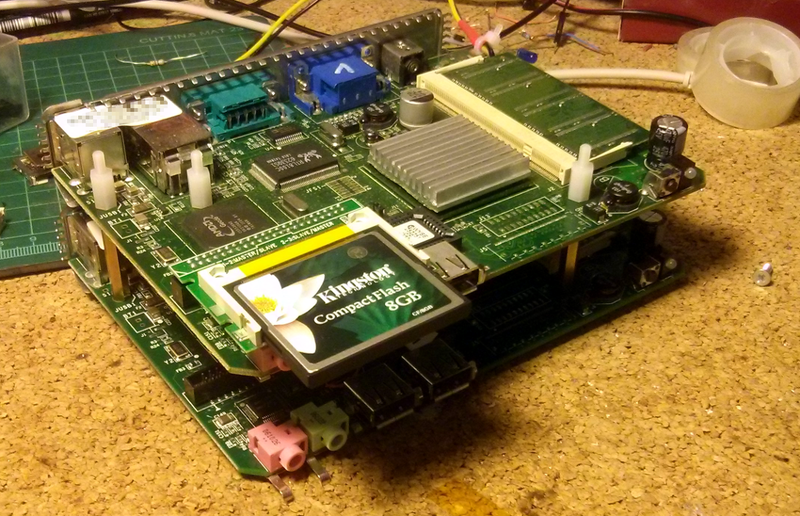 This post is mostly my notes from messing around with this AMD/NSC Geode based thin client. I have tried to boot some operating systems, in the end installed NetBSD/i386 8.0. I was able to run FreeDOS, Linux 2.4 and OpenBSD on it. Winterm S10 board revision A1. They are stackable with standoffs! Winterm s10 is a WYSE thin client. Internally runs a custom operating system that looks and feels like a Windows-based thing. It has an AMD Geode 366Mhz CPU and my units came with a 128MB 2.5V 333Mhz DDR1 SO-DIMM ram stick. I have five of them, 3 have a gray chassis and 2 white. 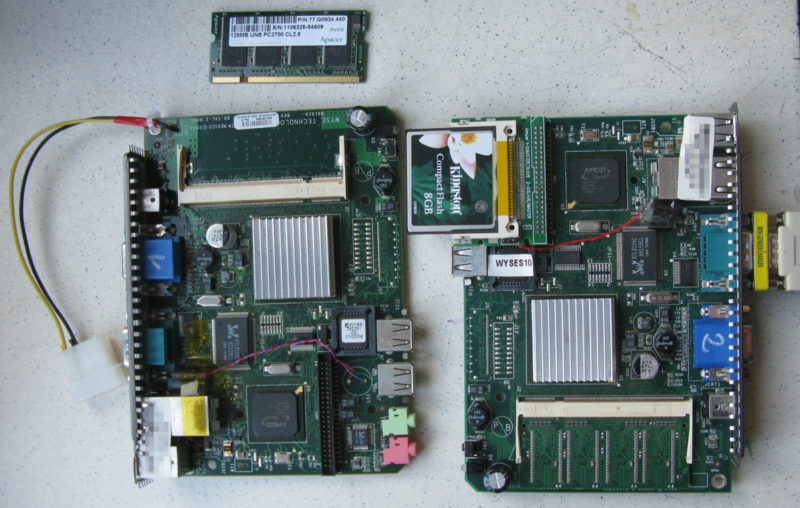 The gray chassis ones have the A1 board revision in them and the white ones, revision B4. Bios in both rev A1 board and rev B4 board that I have been playing with is version 1.14, build date 04/23/2006. Winterm s10 can boot of a usb-sdcard reader, revision A1 boots media without problems, revision B4 seems to ignore media bigger than 2GiB. Both revisions of the motherboard feature a 44 pin, 2.5'' IDE connector. I'm using an IDE to CF card converter that works fine. If you are using a right angle converter then you have to select one where the IDE key pin is faced to the edge of the PCB, as converters the other way around don't fit unless you remove the board from the chassis and desolder and attach the pc speaker with a pair of wires. Booting my rev A1 board is quite weird as for some reason the system won't react to the power button being pressed, instead I connect the DC jack, wait for the orange led to go off and strike the Del key. This brings up the BIOS menu. BIOS password is "Fireport" and cannot be disabled, only changed. Maybe you can set it empty, did not try this. The above problem can be solved by setting "Power Control: Always On", this way the unit starts whenever there is power connected. NetBSD/i386 8.0 booted from a USB SD card reader. The image written to the SD card was the install.img file. Using default options it hangs on a message about pckbc0. Disabling that device helps, to do that press 4 at boot menu and type "boot -c", this will drop you to userconf(4) after the kernel loads, where you disable the AT keyboard controller with "disable pckbc0". This allows you to boot the kernel and get into systinst(8). At first i went too far and disabled whole ISA bus but that caused the system to not see my CF card! 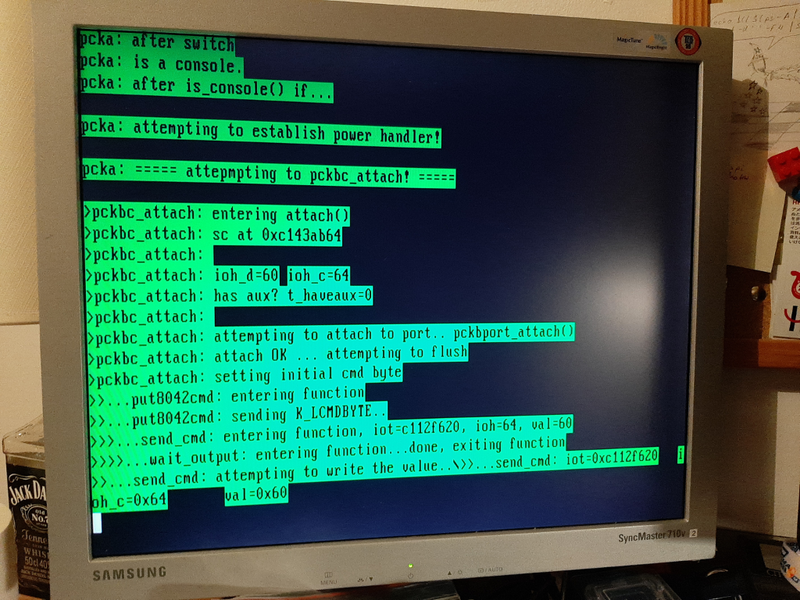 "userconf disable pckbc0; boot netbsd"
With pckbc0 disabled the system has successfully booted up and I was greeted by the white-on-blue menu of sysinst(8). Apart from that pckbc0 quirk, it is a typical NetBSD/i386 installation. Due to this easy probing availability its a good board for driver development, you can easily probe and even attach additional SMBus (or the like) chips to it! CS5536AD datasheet is available online, ball assignments page 25 onwards. BT1 - Top pin connected to Vbat [A3], bottom to GND (board orientation the same as in point 1). Vbat pin is described as "RTC battery". Chapter 7.1.4 of the datasheet shows voltage range from min 3.14 to max 3.46, typical 3.3 - according to the datasheet a simple CR2032 will not work! rest of the jumpers unindentified. This is pretty difficult due to this being a multilayer board! 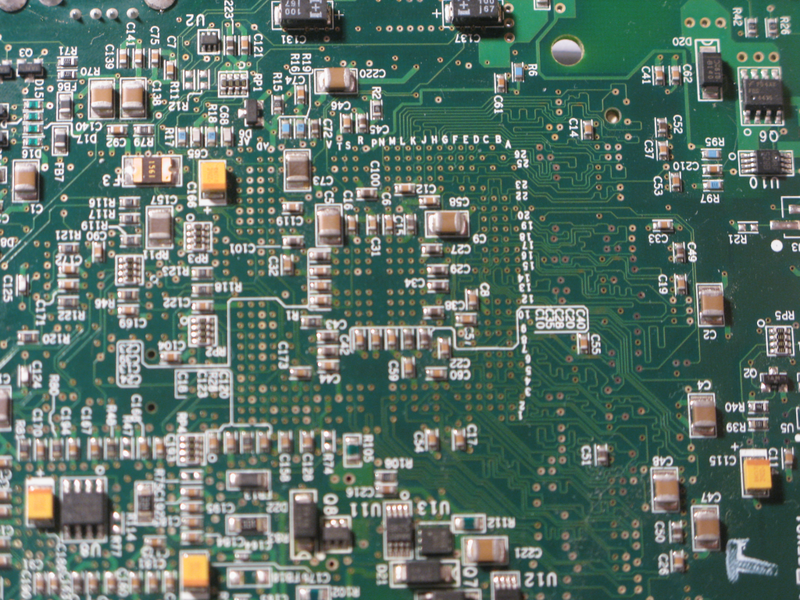 7 vias in a copper fill next to the big cap near power button, looks like -12V output from a DCDC. Serial interface running on +/-9V, should work with everything. The kernel does not work? I'm curious why the NetBSD kernel hangs on boot if pckbc0 is not disabled. The kernel boots fine if you compile it without pckbc, but that causes some other problems - like for example no keyboard until the kernel initializes the USB devices, which leaves you without the ability to type during that time. When I first installed NetBSD on it I managed to screw up the partition table (on i386 partition C and D is whole NetBSD MBR partition and whole disk respectively). I could not reproduce that screwup. It might have been something to do with OpenBSD being installed previously on that (but when OpenBSD froze on it's kernel relink stage for 30 minutes (this is a 366MHz Geode and a slow IDE interface, remember?) i just yanked the power cord and installed NetBSD on it). So far I've managed to find the exact bus_space_write_1 call that hangs the CPU! The kernel hangs when trying to write a value to IO port 0x64, which is the PS/2 command register. The CS5536AD Companion Devive emulates a PS/2 keyboard controller. It maps I/O port writes to the right MSRs (Model Specific Registers - special registers in x86 based CPUs available with rdmsr and wrmsr instructions, since Pentium). IO ports 60h and 64h are mapped to allow BIOS and such to interface with the emulated PS/2 keyboard "the old way". Luckily during my kernel debugging I have been taking pictures of what my printf invocations produced on the screen in the boot log. This is one of those images. The kernel is not paused here, nor an infinite loop was inserted. It froze - right after writing the value of 0x60 to port 64h. In fact it didnt even exit the send_cmd function, or for some other reason did not execute the next printfs. ... and the kernel booted successfully to a shell! Having restarted the computer a couple of times to check if that wasn't some crazy strike of luck I copied the compiled kernel binary to a regular PC running NetBSD and tried to boot it. It failed. The computer reset just a moment after the bootloader loaded and executed the kernel. Whatever that was, disabling (enabling?) the A20 Sequence by sending 0xD1 after every byte makes the kernel boot successfully on the thin client. And on nothing else. This topic is still open to discussion - is it really the fault of the chip or is it one of those bugs that are less clear the longer you stare at it? 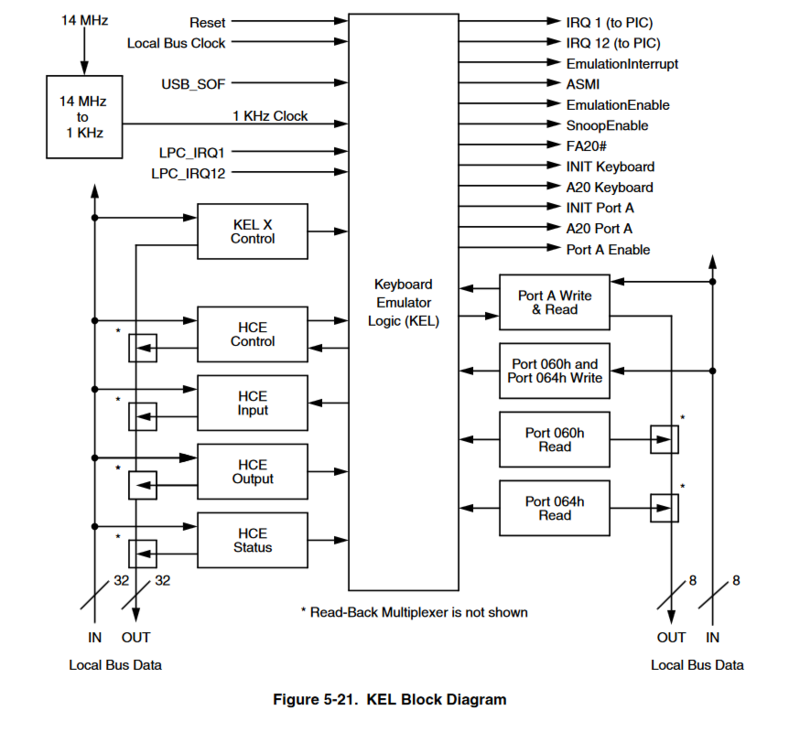 The CS5536 datasheet is here.